The staff meeting room at Alicia Sanchez International Elementary School has been transformed into a mini dentist office on what otherwise is a normal school day. There is a portable dental chair, portable dental and x-ray units and an intraoral camera to look inside tiny mouths. A majority of the students at Sanchez are from low income families. Throughout the day, more than 50 first, second and third graders will have a dental check-up by a dental hygienist. She will screen the children’s teeth to identify potential problems, apply fluoride varnish and sealants and clean their teeth. For some this is their first dental visit. “In this high-risk patient population, about one in four kids will have a cavity by the time they’re two,” explains Dr. Dennis Lewis, president and CEO of Dental Aid, the organization screening the students. “And low-income children suffer nearly twelve times more lost school time due to poor oral health than children from higher-income families,” he adds. Dental Aid is using innovative technology to provide accessible and affordable oral health care for low income and uninsured residents of Boulder and Broomfield counties. “Nearly 70,000 people in Boulder County are struggling to access dental care,” says Dr. Lewis. 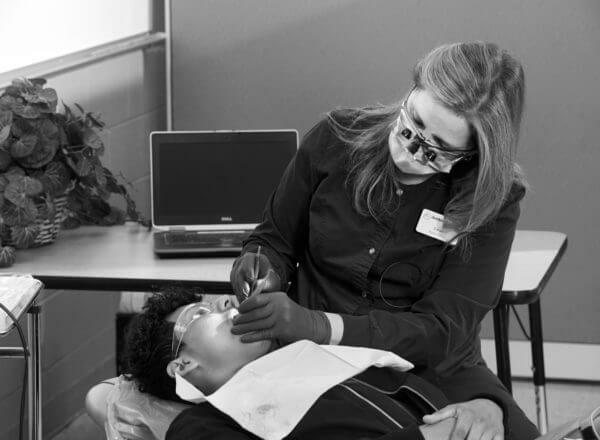 Rather than requiring patients to go to a clinic, dental hygienists travel to sites like schools and conduct dental check-ups using portable equipment that is linked to the home office. Results are sent electronically to a dentist who diagnoses and recommends treatment when necessary. Many of the patients receive all the care they need right there, and uninsured children receive the services at no charge. Rose Community Foundation has long valued innovation and thoughtful risk-taking. The Foundation often invests in organizations offering services that break down barriers and expand access. Dental Aid is one of several innovative technology-based health care delivery programs that Rose Community Foundation’s health program supported in 2016.